Asiatic Turkey. Coal Resources of the World. 1 : 6336000 McInnes, William; Leach, W.W.; Dowling, D.B. Turkey, Israel, Cyprus, Lebanon, Syria, Iraq, Jordan. 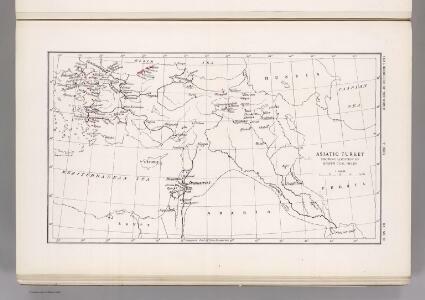 Pergamon World Atlas. Countries Situated between Shiraz and Constantinople. 1 : 6000000 Tanner, Henry S.
1 : 4007520 Johnston, W. & A.K. 1 : 7603200 Tallis, J. & F.
Asie-Mineure, Armenie, Syrie, Mesopotamie, Caucase. 1 : 5400000 Picquet, C.
Asia Minor, Syria & Mesopotamia. Asie Mineure, Armenie, Syrie, Mesopotamie. 1 : 5400000 Levasseur, E.
Publisher: McInnes, William; Leach, W.W.; Dowling, D.B.